I woke up this morning and thought to myself, “I want some Chinese food.” Obviously being in New York, that means Chinatown. So, before I left my house I just grab a cup of coffee and a banana, in hopes of stuffing myself with good Chinese food. The problem with the morning commute is that I haven’t been to Chinatown in a loong time, as in the last time I’ve written about Chinatown was about 2 months ago, long. 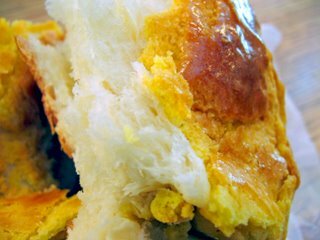 So, I’ve lost my way there wandering around the streets trying to figure out where the heck are the three spots I want to go to: Dumpling House, Dragon Boat Cafe, and Double Crispy. The regular egg tart is 50 cents and the vanilla/creme brulee type is 80 cents; in other words, it cost me $1.30. It was limited in their flavor varieties because it’s 7:30 AM. It’s fine with me, I have more room to eat more food. Both tarts were slightly warm to the touch: it’s a good thing because it’s fresh. The regular tart is tasty. It’s just the way it should be; the crust or tart shell is both flaky and crumbly that it has a good balance of both qualities that is desired in any pie or tart crust. 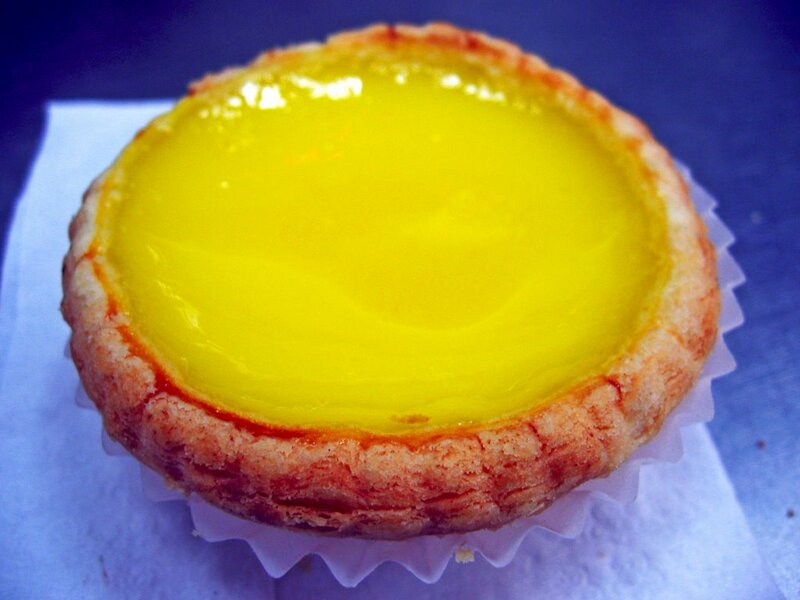 Not greasy (I’ve eaten several tarts that are pretty darn oily: not a good thing) and the custard itself has a smooth, rich, and creamy mouthfeel, just enough sweetness that it doesn’t kill your palate. The vanilla/creme brulee tart has the same characteristics as the regular. 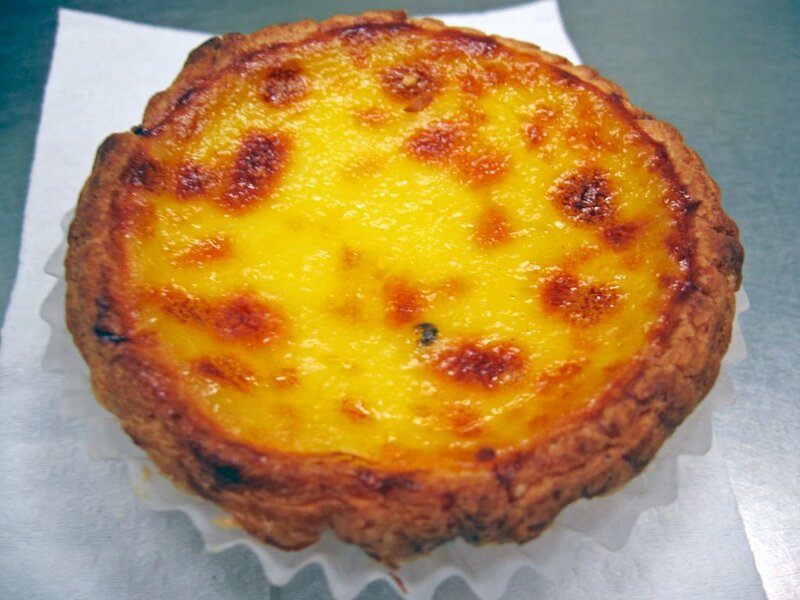 The differences are that it has the dark spots on the custard that looks like a creme brulee of sorts; it’s more sweeter (but not killer sweet) and has a stronger vanilla flavor. It’s a nice variation. 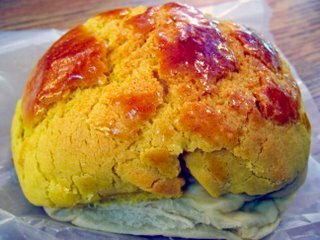 I’ve tried those – what I call weird flavors – green tea and black sesame from Tai Pan Bakery in Flushing and I don’t really like it. It just tastes strange to me (I think the flavors were off?) but that was years ago but I’m willing to try Crispy’s variations since their tarts are better than Tai Pan’s, in my opinion. The next stop is Dragon Boat Cafe. It’s a buzzing place where it seems like many Chinese locals come here for their breakfast and it’s my first time here. I walked in and thought to myself, “What am I in the mood for?” Even one of the girls who worked there was waiting for my order as I stared at the dizzying array of buns, tarts, cakes, etc. 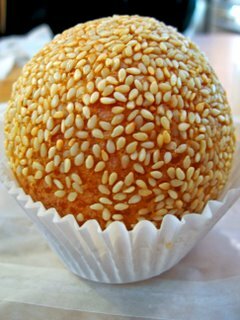 Finally I came up with the decision of getting a fried sesame ball (called jien duy, in Cantonese; cost 80 cents) and a pineapple bun (bo lo bau; cost 60 cents), totaling $1.30. I know, the whole $1.30 thing is somehow repeating but it was really unplanned. It’s somewhat compressed since I have to tear the darn thing to have a texture shot, sorry, but you get the point. It’s slightly sweet and it smells yeasty after I tore the bread into two. bean (once again, sweet), coconut flakes, etc. After eating those and walking around Chinatown for a while, all of a sudden I had a hankering for dumplings. My mind clicked to the Dumpling House. I never went there before except the fact that many people from Chowhound directs others to eat there for cheap dumplings, so I kept that in mind and now I’m there. I didn’t really realize that the location of this place is actually bordering the Lower East Side and Chinatown, so it took me a good deal of time to find this place. It’s actually a small hole-in-the-wall establishment that has a tiny counter with practically no seating, maybe some standing room in the back. A Chinese woman was working there and when I asked for dumplings in Cantonese, she replied back to me in Mandarin. So, with that whole loss of communication there, I went off with English and thankfully she understood me. I bought the standard deal, 5 pan-fried pork and chive dumplings for $1. Probably one of the best deals in town, in my opinion. 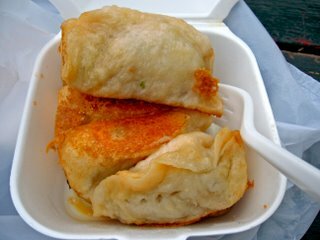 The dumplings are delicious though, despite my nagging annoyance with grease. 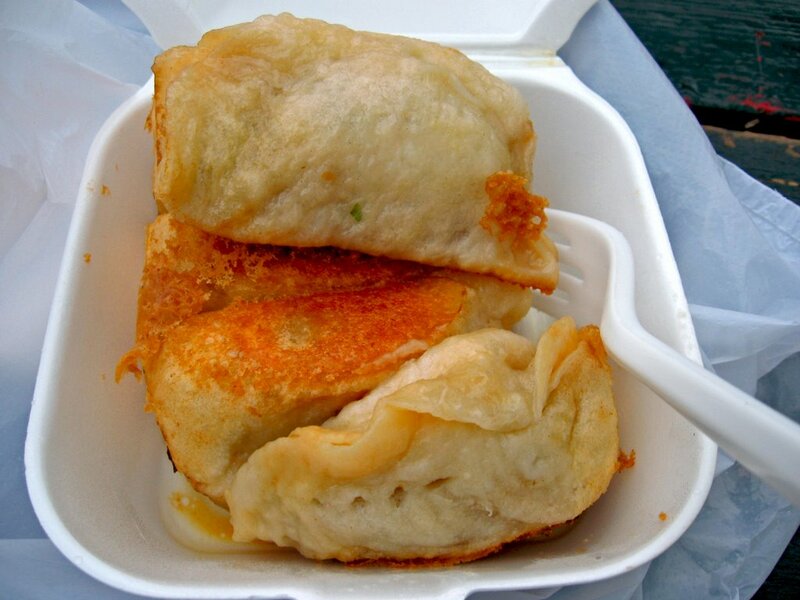 It’s perfectly seasoned, oniony flavored from the chives, and a very nice crunch from the bottom crust; which is a good contrast of the soft, juiciness of the dumpling from a crisp crust from sticking on the wok (the large, round pan that is usually used for pan frying dumplings). I went off with the rest of the morning shopping for calligraphy supplies in Pearl Paint and search for Christmas cards because Christmas is coming and classes are about to be over; I have to start cranking out the cards to friends and family with calligraphy. I had another pang for a snack around 12:30 and I was in Chelsea. I thought of going to Rickshaw’s Dumpling Bar for their chocolate dumplings, since I remembered reading about them last winter in a NY Magazine article. I walked over to that dumpling bar, as they called themselves, and waited on line for a few minutes. It’s lunch hour and the local business crowd are going for their dumplings (the savory ones) for lunch. As I looked around, it basically a clean, well lit place that is slightly Industrial/modern decor – it’s very streamlined and somewhat minimalist with lots of seating. They had a bunch of different options of dumplings from the traditional pork to the low carb and if you want it in soup or fried and then the one that I’m looking for: the chocolate dumplings ($3). Also, I was thirsty and since it’s kind of what I’m considering it as my dessert course of the day, I added the Thai iced coffee ($2.95). It cost me $6.45 with tax. I know, it’s not cheap. They gave me a number and as I waited, it’s photo op time. 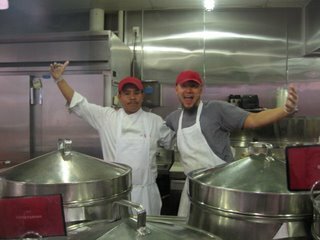 The cook on the right saw me taking pics of the kitchen area and tried to get my attention to take of him, so he grabbed a colleague of his and posed. 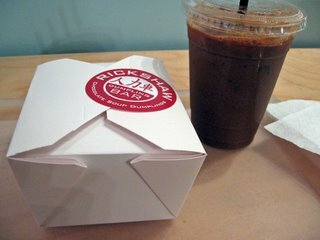 It’s a takeout box containing my 3 chocolate dumplings and my Thai iced coffee. I haven’t tried Thai coffee before but I’ve always heard that it’s a sweet coffee, which was my original forethought of this as my dessert course. It is a sweet, not cloyingly sweet, strong coffee. Not espresso strong but more like a strong brewed coffee flavor that has an initial smoky, bold flavor with a nice caramel finish. Probably it came from the evaporated milk. I’m not too sure but it tasted good. The highlight of the day: the chocolate dumplings. These dumplings that you see above, is taken out of the box and was placed in a pyramid. I don’t like how it looks in that box. It’s more playful now. Anywhoo, the chocolate dumplings are basically deep fried mochi balls filled with melted chocolate with Plugra butter (ooh…those of you who aren’t keen on the butter business, Plugra butter is basically an American made butter from Keller’s Creamery with a much higher butterfat content that of the typical American brand, 82.5% compared to 80%; so less water content equals richer flavor and texture to your food, pastry, etc.). I took a bite from one of these dumplings and it oozed chocolate with the synchronization of the slightly crisp exterior. It tasted nutty from the black sesame seeds, dark chocolate was good (about 60% cocoa) and it wasn’t very sweet. I would dub this my little chocolate dumpling of love. hahaha… It’s really good and it goes well with the coffee. Bitten chocolate dumpling with its siblings. That sounds wrong, doesn’t it? That’s my Chinese/Asian food craving day, even though it’s more Asian fusion for dessert but you know what I mean. For a map of where I went, click here. 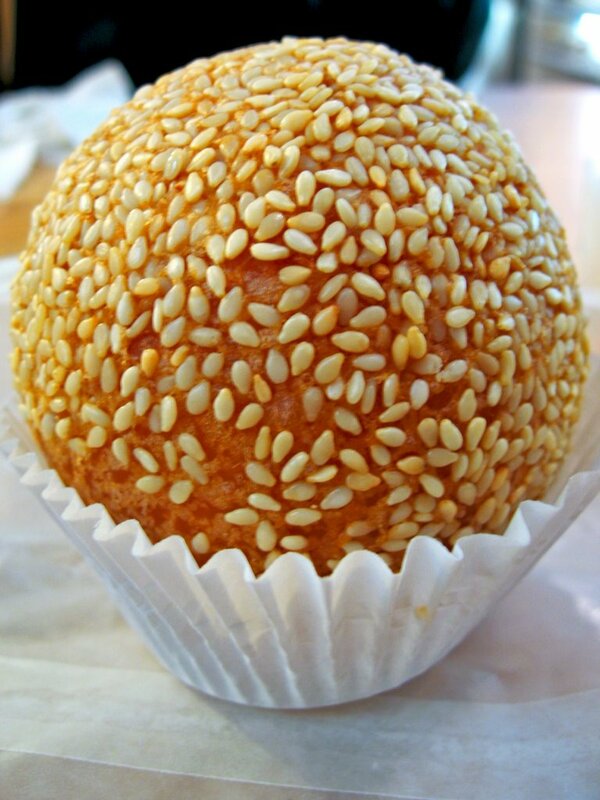 That’s a byootiful lookin fried sesame ball. I gotta try those chocolate dumplings when I go back! Robyn – Thanks for the compliments! The chocolate dumplings are truly awesome! Gooey and chocolatey insides with a nutty, crisp outside. What could beat that? !